At the American Kennel Club®, we're not just champion dogs. We're the dogs' champion — all dogs. We believe that all dogs deserve training and a responsible owner and our goal is to reward responsible dog ownership. The AKC S.T.A.R. Puppy is an exciting new program designed to get dog owners and their puppies off to a good start. The AKC S.T.A.R. Puppy Program is an incentive program for loving dog owners who have taken the time to take their puppies through a basic training class. Training classes teach you how to best communicate with your puppy. Organized training classes also provide an opportunity for your dog to socialize with other dogs. In classes aimed at earning the AKC S.T.A.R. Puppy distinction, you'll be able to get information on all of your puppy-raising questions including housetraining, chewing, and the most effective way to teach practical skills such as coming when called. AKC S.T.A.R. Puppy training is a natural lead in to the AKC® Canine Good Citizen® Program. When you complete the S.T.A.R. 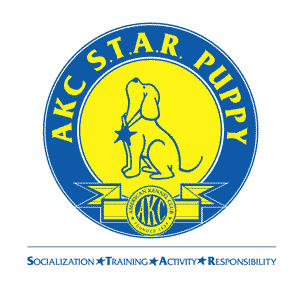 puppy program with your puppy (up to 1 year old), your puppy is eligible for the S.T.A.R distinction from AKC. You'll attend any puppy or basic training class at least 6-weeks. Your instructor will administer the AKC S.T.A.R. Puppy test at the end of the course. 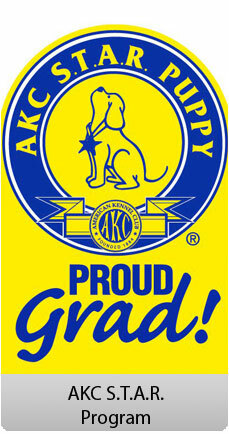 Upon passing the test, you'll get an application to send to AKC® for enrollment in the AKC S.T.A.R. Puppy Program. All dogs are welcome to participate in the AKC S.T.A.R. Puppy℠ Program including purebreds and mixed breeds.